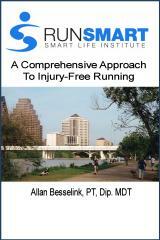 Here are some recent reviews of "RunSmart: A Comprehensive Approach To Injury-Free Running". Paul Terranova - 2nd place, 2009 Capital of Texas Triathlon and Ironman triathlete: "Allan's philosophy and approach have kept me injury-free for the past four years. As a long-distance age-group triathlete with a full-time job, staying healthy and uninjured has been one of my keys to seeing continuous improvement. What I love most about the RunSmart approach is that it allows the individual athlete to take control of his or her training by giving them the "why?" behind loading strategies (cognitive/mechanical/nutritional), recovery, scheduling, and pacing. This is a must-have reference for the aspiring multisport athlete!" Josh Kennedy - Western States 100 finisher: "Allan's fresh perspective on recovery-centered running and training is a welcome shift away from 100-mile weeks, 'more is better', and cookie-cutter approaches. All levels of athletes from working parents, college athletes, weekend warriors, and dedicated amateur runners can apply his principles for a better and more consistent level of running performance." Curt Rickert - Mckenzie Diplomat: "'RunSmart' is a complete manual for the endurance athlete. The scientific method and common sense are blended to educate the runner to make informed choices in managing his or her endurance sport. As a Diplomat in Mechanical Diagnosis and Therapy, I am especially encouraged in the application of MDT in treating injuries encountered by runners."